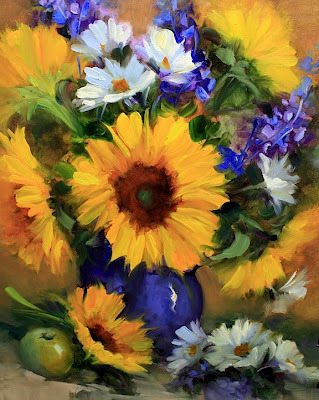 Spotlight Sunflowers and Daisies is one of a few new works in the studio this week, following a trip to Scottsdale, Arizona, and a beautiful getaway to the JW Marriott Camelback Resort. The temps in Scottsdale were higher than Dallas, but the pools, misters, and umbrellas made up for the heat! While visiting Scottsdale, I took a workshop with Hedi Moran, whose work has always inspired me. Hedi was a fabulous teacher and a lovely lady, and I highly recommend her workshops to anyone who loves color and loves flowers. She has a beautiful, loose approach using transparent underpaintings. As soon as I returned to Texas, I broke out my biggest brushes and got to work! Hedi teaches at all levels, and is a master, but for those just beginning oil or flower painting, she is an excellent way to dip your toes in the water. 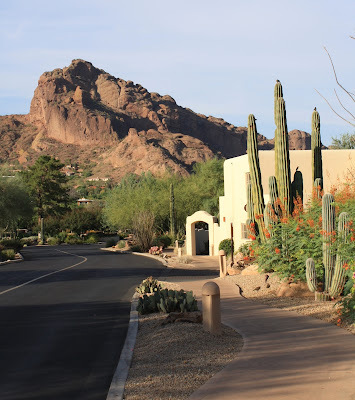 Here are a few images of the grounds and landscape around the Camelback Resort - Enjoy! in Texas on the farm where I grew up. this painting is just stunning. I love how the blue flowers just pop. It really sets off the sunflower and dasies. 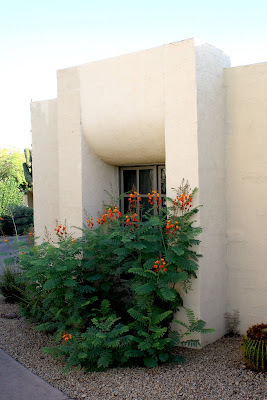 Nancy, that green bush with the orange flowers is a Mexican Bird of Paradise, they also come in yellow, more tree like and one that is the same bushy type but with yellow flowers that have very long red things coming out of them. Very drought tolerant. Dripper irrigation, it is wonderful. Another lovely sunflower painting with daisies and blue bowl!! oh what a wonderful painting, trip and class! i am so glad you go to art camp! it is so much fun and that is what life is all about! Sherry thank you, I love putting violet-blues and sunflowers together! Marsha those plants seemed to glow, they are so beautiful. Thank you little Benny and Lily! Tree Hugger I appreciate that. Your helper is quite the charmer! Archie you are so wise for a young babypug. 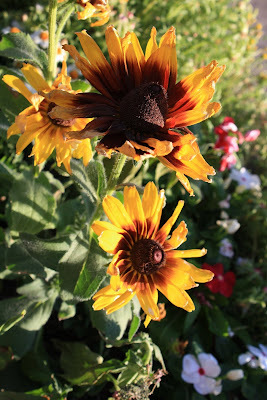 I love your pictures on your blog today. How on earth does your mom get anything done without you? Thank you Jo! I had never heard of drip irrigation before, it is ingenious. Another beauty, Nancy. Hope to hear about your workshop, love it that we all keep learning and discovering more about our art. Sounds like a wonderful trip with inspiring and motivational people and love this new floral and the melding of colors.